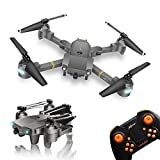 · ★ Gravity Sensor Function: G-sensor mode allows the quadcopter to automatically track the way you move your smartphone. Allows you to fly your racing drone forward/back/left/right in correspondence with the angle at which you hold your mobile device. · ★ Headless Mode and Optical Flow Positioning: These two important functions certainly make things easier for beginners. · ★ One-key return function: make sure you don´t have to worry about losing this drone. Wherever you fly, press the one-key return button and it will return directly to you. · ★ FOLDING STRUCTURE DESIGN: Folding aerofoils and flexible blades can not only make the quadcopter smaller and more portable, but also prevent users from cutting and provide a better and safer use experience.